Oriental and area rugs are unique, decorative and functional. They add beauty to your home's interior while increasing its functionality. Like carpets, they are subject to wear-and-tear issues in high-traffic areas and tend to trap dust and allergens if not properly maintained. Because area rugs are investments, maybe even family heirlooms, they should be professionally cleaned on a regular basis. That is where Teasdale Fenton can help. Our IICRC-certified cleaning experts are just as skilled with cleaning area rugs as they are with your residential and commercial carpets. Teasdale Fenton will restore your area rugs to their original, beautiful condition and extend their life by protecting the fibers from harmful debris and stains. Our exclusive, in-plant cleaning service provides benefits you can’t get at home, especially for the removal of tough stains and odors. Our proven processes give area rugs a thorough, deep-down cleaning at your home or office in the Greater Dayton, OH area. We always consider factors such as dimensional stability and colorfastness before choosing a cleaning method that is safe and effective. Vacuum area rugs on a regular basis to avoid accumulating debris, which abrades fibers and wears out the rug. Area rugs should be professionally cleaned every two years. Rugs in heavily traveled areas may need to be cleaned more frequently. Protect your area rugs with a stain-resistant product sold by a knowledgeable rug and carpet expert. Address stains immediately by calling a trained professional. Commercial carpet cleaners may be too harsh and cause permanent damage. Use padding under area rugs to minimize wear, offer skid resistance, add comfort and absorb noise. Avoid a seller who suggests that area rugs should not be cleaned. This may indicate the rug has been painted or contains fugitive dyes. Avoid direct sunlight on rugs or rotate rugs in sunlight to avoid uneven fading. For deeper cleaning of rugs with special needs, such as stains and odors from pet urine, we offer exclusive in-plant cleaning services that you will not be able to access from home. Our certified technicians have dedicated cleaning pools to remove tough stains that require deodorization. All deodorization processes should be performed in our plant. 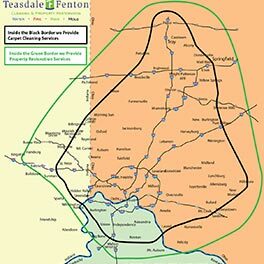 Teasdale Fenton will pick up and return your rugs to your home, free of cost. When you need to have an Oriental or area rug professionally cleaned, you can trust the IICRC-certified pros from Teasdale Fenton to do the job quickly, correctly and at a customer-friendly price. Contact us at 937-600-6717 for a free estimate or to learn more about our services. We have been creating satisfied customers in the Greater Dayton, Ohio area for almost two decades! Copyright © 2019 Teasdale Fenton Dayton | All rights reserved.